← Dua Planet Tersembunyi di Tata Surya Kita ? Could a wormhole in our galaxy take us to another UNIVERSE ? A giant doorway to another universe may exist at the centre of the Milky Way, and it could be large enough to swallow spaceships whole. 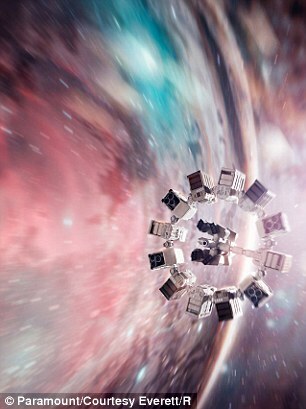 This is according to a recent study which claims it would be possible to travel through a wormhole in a similar way to moving through the space-time tunnel in the film Interstellar. Wormholes, allowing instantaneous travel between distant points in space and time, are allowed under Einstein’s theory of General Relativity. But most scientists dismiss the idea of ever building one large and stable enough to pass through, and no natural examples have been detected. The extraordinary new theory, published in the journal Annals of Physics, follows the discovery of what appears to be a super-massive black hole at the centre of our galaxy. According to the Italian authors, the black hole – a region of concentrated gravity that distorts space-time – may be a wormhole in disguise. The scientists, who base their conclusion on complex mathematical models, say the portal could be constructed from dark matter. This is invisible and mysterious material making up around 26 per cent of the universe. The researchers combined the map of the dark matter in the Milky Way with the most recent Big Bang model to explain the universe. 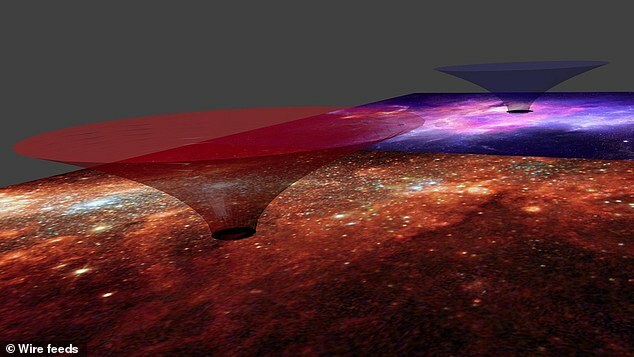 ‘What we get is that our galaxy could really contain one of these tunnels, and that the tunnel could even be the size of the galaxy itself,’ said Professor Paulo Salucci, from the International School for Advanced Studies in Trieste, Italy. ‘But there’s more. We could even travel through this tunnel, since, based on our calculations, it could be navigable. Just like the one we’ve all seen in the recent film ‘Interstellar”. He said the research was surprisingly close to what was depicted in director Christopher Nolan’s movie, for which theoretical physicist Kip Thorne provided technical assistance. 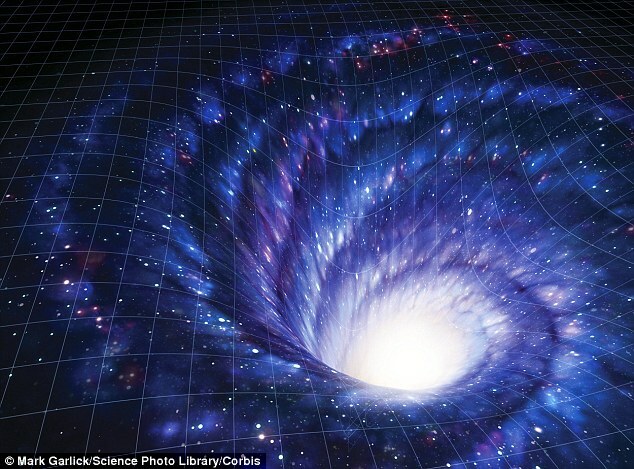 Any wormholes existing in nature have previously been assumed to be microscopic rips in the fabric of space-time. But the one possibly lying at the centre of the Milky Way would be large enough to swallow up a spaceship. Other ‘spiral’ galaxies similar to the Milky Way – like its neighbour Andromeda – may also contain wormholes, the scientists believe. Theoretically it might be possible to test the idea by comparing the Milky Way with a different type of nearby galaxy, such as one of the irregular Magellanic Clouds. 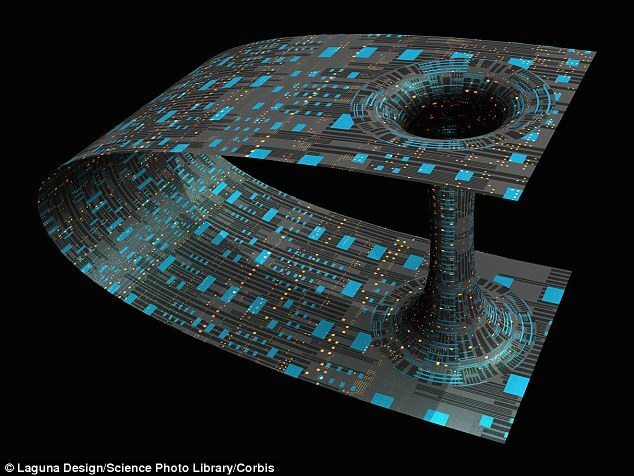 In their paper, the scientists write: ‘Our result is very important because it confirms the possible existence of wormholes in most of the spiral galaxies ..
‘Dark matter may supply the fuel for constructing and sustaining a wormhole. The study follows similar research last year in which physicists at Cambridge University arguedthat some wormholes are capable of staying open long enough to send messages backwards and forwards through time. The wormhole would be open just long enough, Dr Butcher suggests, to send a photon through to the centre. Because the ends of a wormhole can exist at different points in time, if Professor Butcher’s theory proves correct, a message could be sent through time. Pos ini dipublikasikan di history, kanzunQALAM, picture dan tag mysterious, science, universe, wormhole. Tandai permalink.